Oakland Police Department defends practice of not taping entire interrogation during trial about Antar Bey’s slaying. OAKLAND — Oakland Police Department’s practice of not taping entire interviews between detectives and suspects and witnesses came under scrutiny this morning as a lead detective testified in the slaying case of Your Black Muslim Bakery leader Antar Bey. Sgt. 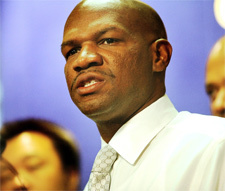 Derwin Longmire repeatedly defended the department’s practice of only taping interviews once a person has already given information that helps the crime, saying to do otherwise would hamper future investigations. “Tape recording has a chilling effect on the subject being interviewed,” Longmire said. “If a person knows they have no chance to keep anonymity, they will not deal with you.” The focus on police taping procedures was spurred by questions from Leonard Ulfelder, the defense attorney for Alfonza Phillips, a 22-year-old who police said killed Bey in a failed carjacking on Oct. 25, 2005. A key witness in the case, Althea Foy, the girlfriend of Phillips at the time, said Monday that she was coerced into accusing her boyfriend of the killing and threatened by police into giving a statement against him.The department’s practice of not taping interviews is also under question in the unrelated killing of Oakland Post Editor Chauncey Bailey, who police said was gunned down Aug. 2 by a bakery handyman.In that case, Longmire allowed the suspected killer and current bakery leader Yusuf Bey IV to speak alone in an interview room without recording devicespresent. After the talk, the suspect, Devaughndre Broussard, now 20, told police he killed Bailey. Broussard’s attorney, LeRue Grim, claims his client was told by Yusuf Bey IV to take the fall for the murder.In the courtroom Tuesday, Longmire said the department had tried to tape record entire interviews, but “failed miserably at that process.” Suspects refused to speak and “most of the time they spent more time looking at the recorder than talking,” Longmire said. While Longmire denied he or Sgt. Tim Nolan, his partner at the time, made threats against Foy, Ulfelder said no one would ever know because the conversations were not recorded. Ulfelder questioned why police don’t tape the interviews — either secretly or openly — and asked Longmire if it made sense to do so to protect police from accusations of brutality and coercion.“I disagree with that,” Longmire said. “We would always be under question. There will always be some scrutiny.”Longmire said defense attorneys will always search for times when police could have employed scare tactics on a witness or suspect, such as when they are in the bathroom or when they are being taken to jail. But it was the “chilling effect” that tape recordings would have on future investigations that concerned Longmire the most. Even if the tape recordings were done secretly, he said, suspects in Oakland would soon know that each time they walk into an interview room, they would be recorded. Longmire said he is able to elicit more information by being kind to suspects and witnesses. Thus, Longmire said, there is no way he threatened Foy with violence or time in prison. Nor did he allow the witness to menstruate through her clothing while waiting for the answer he wanted to hear, as Foy testified Monday, he said. Ulfelder’s questions came before Deputy District Attorney Colleen McMahon played a recording of an interview in which Foy blamed the Bey murder on her boyfriend. The tape, recorded during the final nine minutes of a 45-minute police interview with Foy, has Foy saying Phillips told her he killed Bey.